Born in New York, artist Geraldine Neuwirth studied at the Otis College of Art and Design and was mentored by artist Martin Lubner. 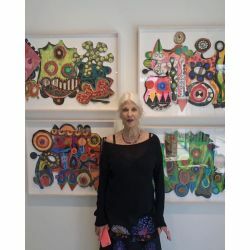 She creates bold, three-dimensional mixed-media paintings using pastel, ink, and collage, pulled from influences including circus, theater, and personal experience. Neuwirth exhibits regularly in New York and Los Angeles.